Limnology of tropical reservoir in Amazon - guenter-gunkel2s Webseite! The build-up of dams for hydropower use may lead to a severe impact on the environment, especially of the aquatic ecosystem. 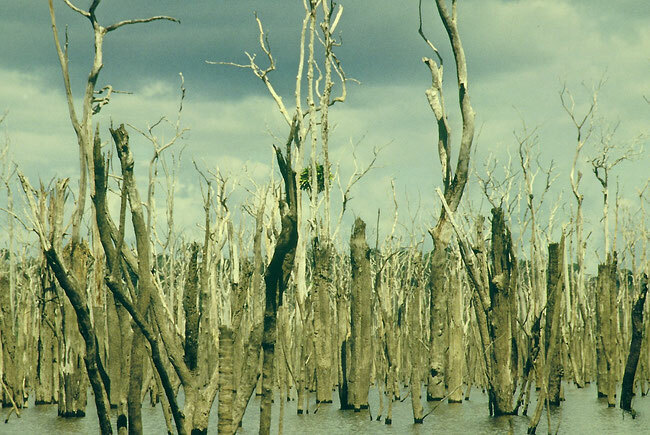 Our research focuses on environmental effects of a more than 20 years old reservoir, the Curuá-Una Reservoir in Amazon (near Santarem, Brazil). After damming up a period of eutrophication occurred, the so called trophic upsurge. Today the reservoir is still at a high trophic level, and a lack of oxygen is detected in the deeper water body of the reservoir. Ongoing and severe environmental effects are observed. Eutrophication of the reservoir and occurrence of oxygen deficits in deep water layers. Mass development of macrophytes, mainly floating on the surface. Accumulation of iron formed by redox-chemical mobilization and precipitation of iron in the turbine area. The inundated vegetation is not mineralized, caused by water level changes with damage to wood consuming organisms. We must assume that the trunks rest for more than 100 years in the reservoir. This leads to an impact on boating and fishery. Gunkel, G., Lange, U., Walde, D. & Rosa, J. W. C. (2003) Environmental and operation impacts of Curuá-Una, a reservoir in the Amazon region of Pará/Brazil. Lakes & Reservoirs: Research and Management 8, 202-216. Gunkel G., Lange U., Walde D. & Rosa J. W. C. (2002) Environmental impact of an Amazon Reservoir, Curuá-Una/Pará: Limnological aspects. Proceedings of the German-Brazilian Workshop on Neotropical Ecosystems, Hamburg. 2000. Lieberei, R., Bianchi, H. K., Boehm, V. & Reisdorff (eds.). Hamburg, 511-516.